Just beyond the north wall of the Bahia Palace, in a tranquil quarter of the ancient Marrakech medina, this 18th-century merchant’s home has been elegantly restored as a small chic riad. Called Hayati ("my life"), the property is a memoir of its British owner’s years in the Middle East. It combines classic Moorish architecture with subtle tones of Arabia, Turkey, and Persia. Berber chests, antique kilims, rich Ottoman tapestries complement the riad’s cool white decor. The result is stylish, intimate and extremely comfortable. Set around a columned courtyard edged with palms and lemon trees, with a rare Damascene fountain in the centre, Hayati is a dream of exotic salons, secret nooks and alcoves, plus four luxurious bedrooms, three with fireplaces and all with seductive hammam-style bathrooms with huge tubs. The owner’s study can serve as a fifth double bedroom, also with private bath. Guests at Hayati are graciously received by a caring Marrakshi staff. Professional massage, beauty treatments, chauffeurs and guides are available on request. Hayati’s cook will tempt guests with superb Moroccan tajines and heavenly French desserts. In summer, meals are served on the riad’s roof terrace, with enchanting views of palace walls and the Atlas Mountains. In winter, you can dine by the fire in one of the salons. The riad is especially romantic at night, when candles light the courtyard and incense perfumes the air. The historic Moroccan city is known for its many mosques, ramparts, gardens and imperial palaces. The pink-walled Medina - the ancient area - considered a UNESCO world heritage site - has typical alleys where Moroccan "souks" sell traditional fine and superb textiles, pottery, jewelry. Marrakech holds the promise of incomparable sensations offering an incredible variety of activities. 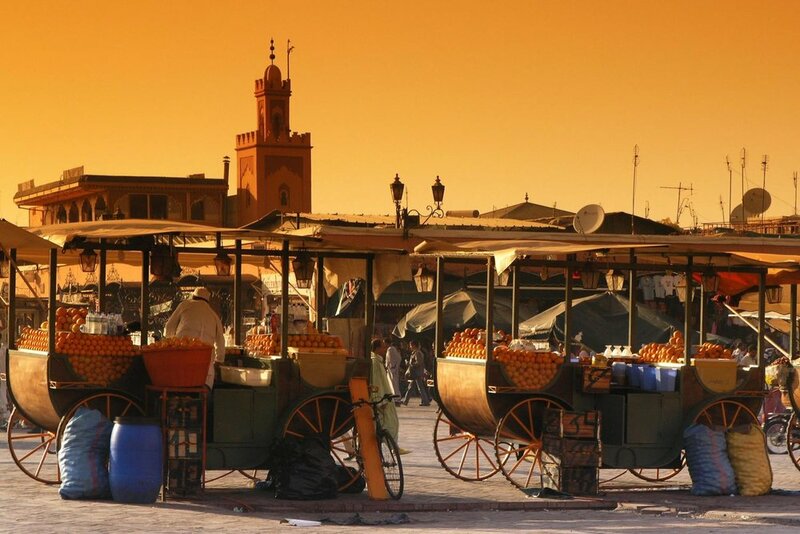 Have a walk in the lively Jemaa El Fna, visit the bazaars with their vibrant colors and original scents. Head out of the walled old center to enter the cosmopolitan neighborhoods of the Ville Nouvelle: the Guéliz and Hivernage have spacious avenues with a variety of chic, contemporary boutiques and emporia. Visit cultural locations like the Palais des Congrès and the magnificent Théâtre Royal and experience Marrakech at night going to the many themed venues, clubs or traditional evenings encountering the country's culture. Enjoy outdoor activities: go skiing in the Atlas Mountains, do water sports at the beautiful Lake Lalla Takerkoust or play golf in elegantly designed green areas. Visit the eco-friendly nature reserve next to Toubkal National Park with the biggest ropes adventure park in Africa, have a breathtaking walk in the Ouzoud Falls or discover Marrakech from above with a tranquil balloon flight or with an ultralight plane.